This pie comes together quickly and is perfect for chocolate and mint lovers. Make it for a St. Patrick's Day celebration! In a small bowl, stir together the Oreo crumbs with the melted butter until all of the crumbs are evenly moistened. Turn the crumbs out into a 9-inch pie plate and, using your fingers, press into an even layer on the bottom and up the sides of the pie plate. Refrigerate while you prepare the filling. Using an electric mixer, beat the cream cheese and powdered sugar on medium speed until light and fluffy, 2 to 3 minutes. Add the peppermint extract and green food coloring and beat until the food coloring is thoroughly incorporated, about 1 minute. 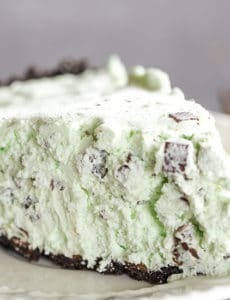 Using a rubber spatula, fold the Cool Whip into the cream mixture, then stir in the chopped Andes Mints. Turn the mixture out into the chilled crust and smooth into an even layer. Refrigerate for at least 1 hour before serving. Leftovers can be stored in the refrigerator, covered with plastic wrap, for up to 4 days.